Note: You can make it with or without Ice cream. With ice cream it tastes yummy. 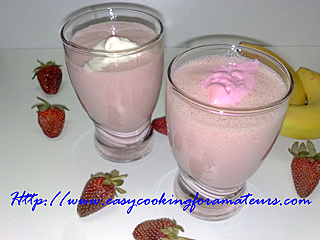 You can either use vanilla or strawberry ice cream (2 scoops) or both (1 scoop each). Add sugar, milk, vanilla ice cream & strawberry ice cream, grind. Put 1/2scoop of vanilla or strawberry ice cream on top. 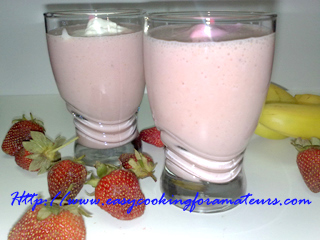 Banana Strawberry Milkshake is ready to serve. Love the milkshake! Banana and strawberry are great together. looks delicious..thanks for the comments..You are always welcome to our spcae..
Looks yummy and for childrens who dislike eating bananas, this is a good choice i will try it. My son has asked me to make this for him.He saw this yesterday.Really a refreshing drink for kids. gotta try this for sure!! This is Nathália - Community Manager from mDhil.com. I found your contact and your Blog link through Indiblogger.in. Congratz! You've got some good piece of writing in your Blog! We're awarding up to Rs 10,000 in prizes for the best rated food photo and recipe at www.mdhil.com/photocontest. In this website you can find all the info. concerning Food Fight and you can also contact us through connect@mdhil.com with any queries. If you're a truly food enthusiastic you can send us up to 5 entries in the contest!